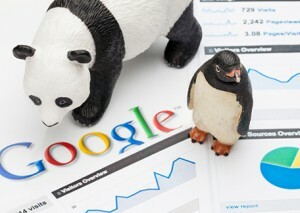 You probably have heard that Google made major changes to its search engine algorithms in 2013. If you’re wondering what these changes mean to you, you’re not alone. Search engines have two basic jobs. The first is evaluating and ranking websites based on the quality of their content and the authority they’ve earned from acquiring inbound links. The second is interpreting the intent of the words and phrases in the search bar and returning the most relevant results, placing the highest quality and most authoritative websites at the top. Last year’s overhaul has improved Google’s performance on both. So what changed last year? The SEO landscape is definitely different. SEO practices recommended by SEO experts in the past won’t work. We’ve read and listened to many posts, tweets and whiteboard presentations by Google insiders and outside experts with real tools to evaluate the results of the changes, often to an overwhelming degree. Much as you would view an impressionist painting from a distance to see the artist’s rendering of its subject, a little bit of time gives perspective to the new SEO landscape created by the changes. Here’s a summary of that landscape. Google can more effectively identify sites with high quality original content above the fold and reward them with higher page ranks. It can also apply penalties to sites that paste together content from other sources or fill the top of the page with ads and little content. Code named Panda, this part of the algorithm goes beyond scanning meta data descriptions and on-page keywords. Think of it as “seeing” visible content on the page to determine the User Experience and assigning the subject of the page based on that visible content. No more manipulating results with keyword stuffing or writing eloquent meta descriptions with little or no real content for the User to view. Google is looking for good User Experiences…the same as you or I, as users, would expect. Google also appears on a mission to lower the authority of sites gaining prominence from mostly purchased or self-published links and keyword-stuffed content. Think of this as the blow to those that “bought their way to the top.” An update to this algorithm originating in early 2012, code named Penguin, was implemented in early 2013. Penguin dealt a real blow to pay-to-list directory sites and aggregator spam blog sites. Is Google acting in its own best interest at eliminating these competitive middlemen? Perhaps, but you can’t complain about their efforts to stop this parasitical practice. It’s early 2014 and rest assured Google is working on algorithm updates. So do we sit and wait for the next round? We can’t… that is, if search results matter to the success of your business. It’s imperative to act now. The current landscape is based on solid principles: focus on the user experience and create high-quality, content-rich sites. Taking any action in either or both of these directions will only improve search engine results and more importantly improve results with Customers. More next time on the second part of a search engine’s job: interpreting the search and returning relevant results.